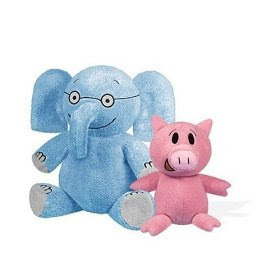 One of Z's current favorites is the Mo Willems Elephant and Piggie series. There are nine books in the series (a tenth comes out in October) but so far we've only read four of them. Z owns Elephants Cannot Dance and My Friend Is Sad and we have two others from the library -- Today I Will Fly! and There Is a Bird on Your Head!. As you can probably guess, the characters in these books are Gerald (an elephant) and Piggie (a pig). These books all deal with feelings, manners and the benefits of friendship. I like that the roles are frequently reversed and each character gets the chance to be the comforter and the comforted. The expressions on these simply drawn characters are fantastic. These aren't your typical easy readers but I think that most kids will love them. And for added fun, if your little one uses the computer, send them to The Elephant and Piggie Dance Game. I have a feeling that it will occupy them for as long as you need it to! Update: We went to the library today and guess what we grabbed ... Are You Ready to Play Outside? and I Am Invited to a Party!. I love Play Outside. It might be my favorite of the ones we've seen so far. Support our site and visit the Mo Willems page on Amazon or find the Elephant & Piggie books at your local library. I saw this series when we visited my nieces out in SD and I thought it was just so cute and funny. Going to have to check these out!!! Luckily Mo Willems is a librarian favorite so you should be able to find a bunch of these to check out.